Transform your unfinished or previously finished basement into a comfortable living space with the award-winning Total Basement Finishing™ (TBF) basement remodeling system, installed by Woods Basement Systems, Inc. The system's wall solutions, flooring, and ceiling products are specially designed for comfort and beauty in the basement. All TBF products are warrantied to resist water, moisture, and mold; provide insulating qualities, dampen noise, and can be customized to fit your basement finishing ideas. We can build a totally functional living space in your basement or simply keep it protected against water and mold so it can be used for extra storage. No matter what you have in mind, we can give you a basement that fits your lifestyle. We offer complete basement finishing services in and around O' Fallon, Belleville, Florissant. Call 1-844-204-8198 to discuss your basement remodeling plan with our specialists or click below to request your free design estimate! The Total Basement Finishing™ System is a complete basement remodeling solution. We carry a wide range of basement remodeling products, including wall panels, finished and unfinished flooring, and ceiling tiles. We also offer additional finishing options like basement windows, lighting, electrical work, and dehumidifiers. All of our products are 100% inorganic, making them waterproof and mold-resistant - ideal for the basement environment, so you won't have to worry about the risks of moisture of flooding. Our system will last you for years and provide you with a beautiful space the whole family will enjoy. 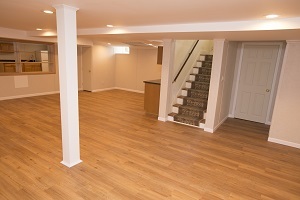 The versatility of our basement finishing system allows for you to do virtually anything you want with your basement. Add an extra bedroom and living space, or mount a TV on our studless basement walls to create an entertainment room! The basement design ideas are endless and Woods Basement Systems, Inc. can help you find the best solution for your home. Ready to get started? Schedule a basement design appointment and get a free estimate to turn your dream basement into a reality. Inexpensive extra space. Remodeling your basement is an excellent way to make use of the space you already have. A basement remodel adds a floor of quiet, private space for less than half the cost per square foot of building an addition (according to the 2013 Remodeling Magazine Cost vs. Value Report). Excellent return on investment. Finishing all or part of your basement is a cost-effective way to increase the value of your house. A basement remodel ranks right up there with kitchen and bath remodeling in terms of making a home more attractive to a potential buyer. Energy savings. Many unfinished basements have too many air leaks and too little insulation. Adding insulation and energy-efficient windows in the basement will improve your home's comfort while saving money on heating and cooling costs. If you're interested in planning and pricing for your remodeling project, Woods Basement Systems, Inc. can help. We would like to offer you a free basement design quote at no obligation. At Woods Basement Systems, Inc., our mission is to provide you with responsible basement finishing, at a fair price, while providing exceptional customer service. We proudly serve Decatur, Ballwin, Belleville, Champaign, St. Peters, Saint Louis and many surrounding areas.